Howard Washington Thurman (November 18, 1899 – April 10, 1981) was an influential African-American author, philosopher, theologian, educator, and civil rights leader. As a prominent religious figure, he played a leading role in many social justice movements and organizations of the twentieth century. Thurman's theology of radical nonviolence influenced and shaped a generation of civil rights activists, and he was a key mentor to leaders within the movement, including Martin Luther King, Jr.
Thurman served as dean of Rankin Chapel at Howard University from 1932 to 1944 and as dean of Marsh Chapel at Boston University from 1953 to 1965. In 1944, he co-founded, along with Alfred Fisk, the first major interracial, interdenominational church in the United States. 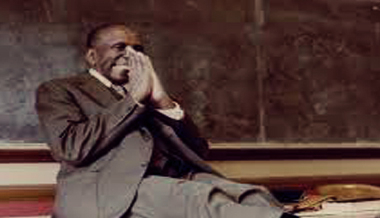 Howard Thurman died on April 10, 1981 in San Francisco, California.